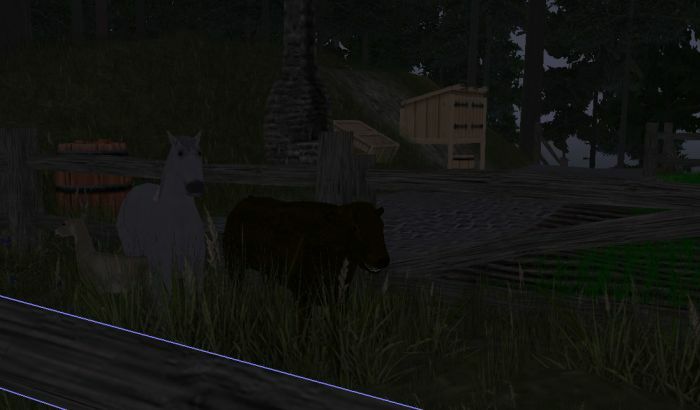 A Horse, A Calf, and a Deer Walk Into a Pen #WURMOnline – Nomadic Gamers, eh! Yesterday on my wanderings I found a fat adolescent bull standing close to what is now known as ‘cow mountain’ by myself and Arkenor, due to the large numbers of cows that we see roaming around the area. My apologies for the screen shot – every time I remember to take one it seems to be dusk or dawn and incredibly dark. In any case, my small pen was a bit too small for all four animals, so I extended it and moved the cows into their own section, leaving the horse and deer to graze among themselves. Thanks to some help from Yetian my forge is finally tucked away inside the mine, he took down two gates that had been causing some issues. Did you know you can’t move a forge through a gate? It considers it a wall, even when open. Lesson learned. I also moved the food storage bin (commonly referred to as the fsb) and got rid of some of the cobblestone. I turned that into field and planted wemp. I’m eager to make a brush so I can groom my animals. Eventually I’d like to get the cows to mate, but they need to grow up a bit first. No under aged pregnancies on my deed! There is still a lot to be done, I’ve continued planting sprouts and flowers, and have been contemplating starting up a second account. I still haven’t found a priest of Fo to convert me yet, but hopefully I’ll find someone on local before too long who won’t be charging an arm and a leg. We’ll see. My deed has also been getting a lot of visitors lately which is quite nice. Scopique has been wandering through the lands of Wurm looking for his own deed, Moxie came by from another server on her boat, Ogur came by to help me with some mining, and then there’s the nexus crew who are always around to lend a hand or offer up answers to my questions. I’m not interested in building the land up with concrete and buildings so much as I prefer a country cottage feel to the area. I’d still like to develop portions of the land of course, especially the dock area, but my main focus has been on getting the trees growing once again to offer a buffer. I hope everyone has had a pleasant week so far, thank goodness it’s Wednesday. Tomorrow is Friday (for me at least) and while this week is certainly better then last week, I’m still looking forward to my other half being home. Safe travels, no matter where you find yourself!